I have a simple tip to make your nordic walking poles safer. 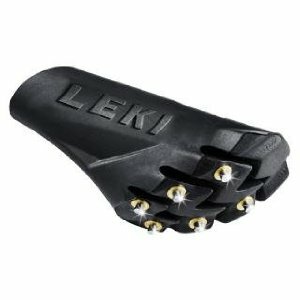 Try the LEKI Nordic Walking pole tips for studded traction. Depending on what part of the world you live in, the winter months can be a challenging time for you and your pursuit of your outside activities. When ice or snow are in your path, your favorite exercise activity, whether it is walking or nordic walking, could lead to a fall. And for those of us with osteoporosis, osteopenia or low bone density, a fall is something we want to avoid. How can you reduce your risk of a fall while winter nordic walking? What recommendations do I have for clients who want to continue their favorite activities outside and reduce the risk of a slip or a fall? I have prepared a short video where I present several options for you to consider. I encourage many of my clients to take up Nordic Walking. Unlike regular walking, it activates a wider range of muscles. And it is a great workout. However, you want to make sure that when walking conditions change, as a result of the weather, that you are able to maintain your stability as you nordic walk. Lately, I have started to use studded traction tips for my nordic poles. These tips were originally designed to allow nordic polers to go from paved trails to wooded and gravel trails without having to remove the rubber tip. Under those conditions, the studded traction tips work very well and are preferred to the spiked tip. Many people find the spiked tip too noisy and disturbs their nordic walking experience. Do Studded Traction Nordic Walking Pole Tips Work Well With Snow? I found that the studded traction tips worked well when I transitioned from pavement to snowy trails (or onto snowy patches on the pavement). They allowed me to maintain my grip and provided necessary stability. I have been encouraging my clients who nordic walk in the winter season to consider including these tips in their toolkit. I was hoping that the studded traction tips would deal with all winter conditions – ice, snow, trails and slick pavement – but I found through experimentation that the tips do not perform as well as I hoped when encountering ice. I still found that the spiked tips delivered the best stability on icy surfaces. My advice: do not rely solely upon the studded traction tips to help you navigate the ice (studs may work well on car tires but the same cannot be said of studs on the tips of your nordic poles). Further, I coach clients to reduce the amount of pressure they place on their poles as they traverse a short span of ice. This reduces the chance that the pole could slip, potentially causing an imbalance. I have been using the LEKI Nordic Walking pole tips for the traction and I am very happy with the product. There may be other products out there that are as good at the LEKI Nordic Walking pole tips. I am not sure. If you come across one you like, please let me know! You can purchase the LEKI in a number of locations. A client recently sent me a link from Amazon (they seem to be selling everything on Amazon these days!) where they sell the product. Happy nordic walking. Please share your nordic walking “tips” with me. I would be excited to share them with the readership. If you are interested in learning more about Nordic Walking and want improve your skills, you can learn more about my Nordic Walking training.